(Medora, ND) – The Theodore Roosevelt Medora Foundation is excited to announce that we awarded our first ever recipient of the distinguished Bully Spirit Award to Rolf Sletten. Rolf has been involved with Harold Schafer and the Theodore Roosevelt Medora Foundation since before its founding in 1986. He is an expert volunteer, Medora’s right-hand man, and a superlative ambassador for our vibrant tourist town. Rolf is a remarkable author and historian of Medora and Theodore Roosevelt, the topics of his two most prevalent books; Medora – Boom, Bust, and Resurrection and Roosevelt’s Ranches both of which he donated to the Theodore Roosevelt Medora Foundation. Not to mention, he is the most polite, gracious, and friendlies cowboy around. Chairman, Ed Schafer presented this new distinguished honor at our 2018 Rough Riders Roundup event, an event hosted for annual members who are at the base of all development projects and preservation in Medora. Read the rest of Ed Schafers Remarks about Rolf at this link. 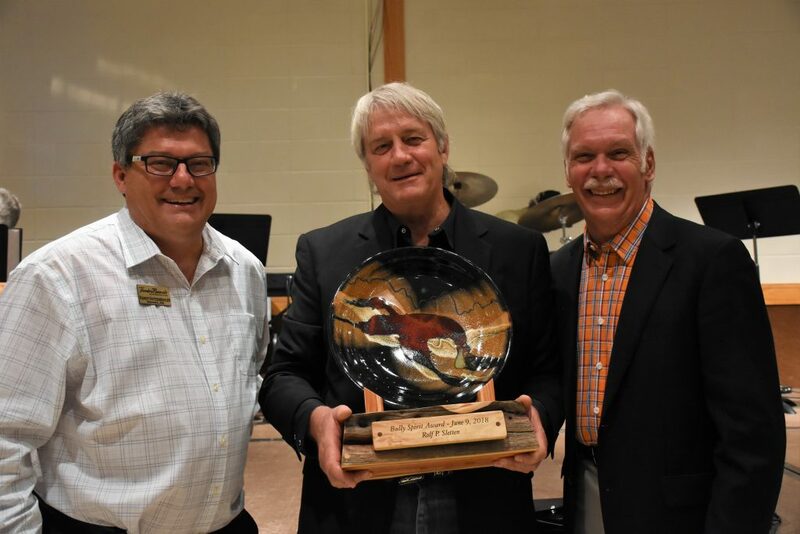 Rolf Sletten was an obvious choice to be the first recipient of our Bully Spirit Award because of his passion for Medora and his evergrowing relationship with the Theodore Roosevelt Medora Foundation. Rolf will set the bar for recipients to follow him, watch Rolf’s acceptance speech here. Today, we at TRMF strive to accomplish its mission to preserve, present, and serve all that Harold loved about Medora by operating history, education, entertainment businesses that allow the traveling public to fully enjoy the beautiful North Dakota Badlands. Through the contributions and teamwork of a board of directors, a full-time staff of 45, over 300 seasonal employees, more than 500 seasonal volunteers, and financial backing from generous supporters, TRMF connects people to Medora for positive, life-changing experiences.